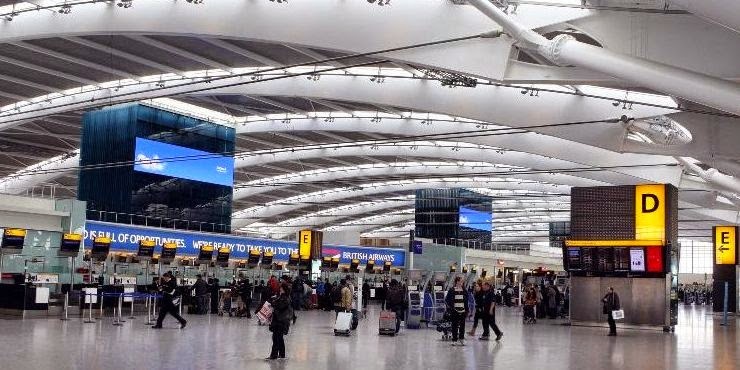 Heathrow Airport (London): Opening in 1929 as a small airfield, Heathrow international Airport is now the busiest airport in the United Kingdom and the third busiest airport in the world in terms of total traffic. best_airport_terminal.htm ) in the annual world best airport awards. Heathrow Airport Holdings own and operate the airport that also operates three other airports. Heathrow airport is the main hub and base of Virgin Atlantic and the primary hub of British Airways. From Heathrow 90 airlines fly to about 170 destinations worldwide. There are around 69 million passengers using the airport annually and it is worth noting that around 3.8 million of these travelled between Heathrow and JFK Airport in New York. It had been proposed for Heathrow to extend and add one more runway and a sixth terminal in 2009 but this proposal was met with significant controversy because of the likely impact of greenhouse gas emissions on the local community. Another proposal being mooted is to extend the airport by expanding its capacity. The aim of this proposal is to extend the length of both runways to 7000 metres and divided into four runways. How to reach Heathrow: As you would expect from such an internationally important airport, there are plenty of options to reach Heathrow airport; including by train, bus and taxi. Bus: Many bus and coach services depart Heathrow connecting the airport with destinations across the UK from Heathrow airport central bus station which serves terminals 1 and 3. National Express and the Oxford Bus Company provide long distance bus services to the airport from various parts of the UK. From the airport there is also a HotelHoppa bus service connecting the airport with hotels in the area. Taxi: Taxes are available to Heathrow from anywhere in London and just about anywhere in the UK. In addition to the more traditional means of reaching the airport, Heathrow also has cycle routes and bicycle parking as well as inter terminal services.